Standing in the Amsterdam airport, Patrick is just as likely to get lost standing still as he is wandering in the congested forests of southern Uganda. But he was no longer in Africa anymore, and he needed to find his gate for the flight home. Patrick Keaveny is a Creighton University undergraduate who recently completed a backpack journalism class in Uganda lasting two weeks. Two weeks anywhere with Patrick is enough time to see that he is not afraid to push past the status quo in any social situation. But this trip to Uganda was partly a search for who he is and how that will affect his current life. Home for Patrick growing up was never permanent. Every few years his father’s work required relocating, and he was stuck as the new kid. Even for a child with dual American and Irish citizenship, it was difficult to make permanent friendships. “Sometimes I felt like I was never going to fit in,” he says when talking about fraternizing with his classmates. This sentiment has embedded itself inside Patrick’s introspection. Behind his calm, cool demeanor is a man who sees himself “on the fringes of society.” For the past two weeks he was definitely an outsider in a foreign Ugandan culture. But he says that Uganda has given him strength when he feels like an outsider in the States, as well. Upon returning home, Patrick says that Uganda has made him more “bulletproof to destructive criticism and more open to constructive criticism.” But for someone who gets the most use out of every article of clothing when most would have given in to laundry while abroad, the journey does not end at the ability to handle different types of criticism. Patrick has also found strength in witnessing the hardships of many Ugandans. His philosophical character is particularly interested in these people’s ability to overcome hardship. 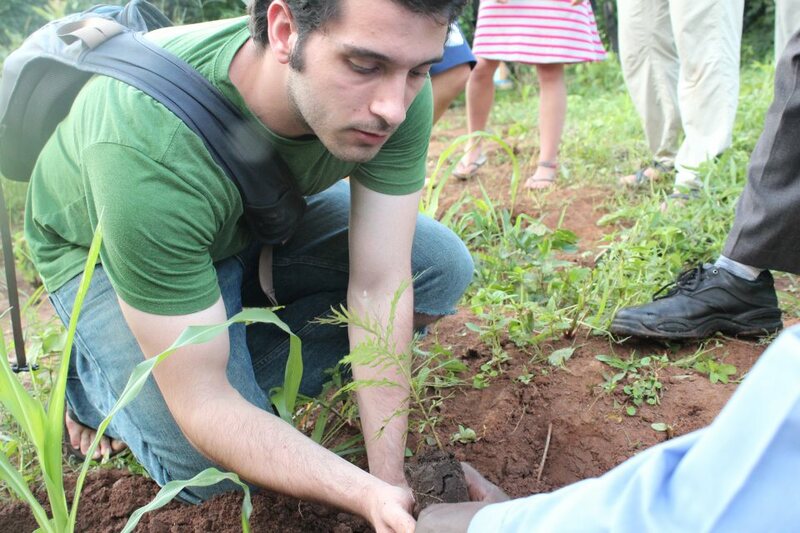 Patrick planting a tree outside Ave Maria in Lira. “If they can find strength to fight difficulty in their life, I can find the strength to tackle the difficulties in mine,” he says. He has learned to appreciate the fortune that he has at his disposal, mentioning his education and mindset. It has helped him discover appreciation for his many positive traits. Before Uganda, there had been more doubt in who he was. He wondered if he would ever feel normal. After Uganda he is more accepting of his role as an outsider. 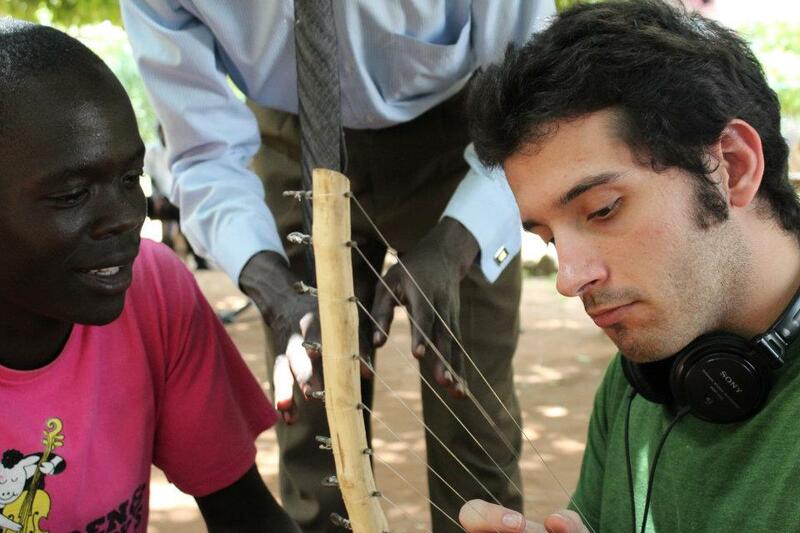 Patrick learning how to play a traditional Uganda instrument at Ave Maria. Patrick is a musician and can play several instruments. As a self-identified outsider, Patrick brings a unique perspective to any conversation. Studying to be a computer scientist and journalist, he talks about creativity as an algorithm and societal norms as needing to be broken. Uganda has helped make Patrick more comfortable with how he sees himself relative to his environment. Patrick arrives to a familiar setting in Omaha but with a fresh outlook on his life.